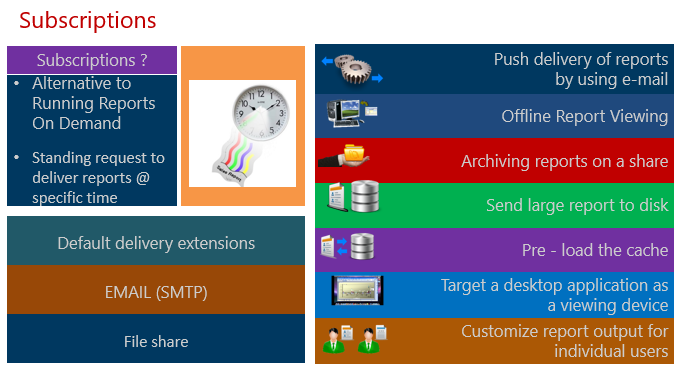 Subscription option with SSRS Reporting tool enables a user to schedule a report to deliver to a mail box as an attachment or to a network shared drive on a regular interval like everyday at 9am or every Monday at 10am or every month, every quarter, etc., based on the business requirements. This subscription is a great feature which enables a user to still see the report and data on that specific date and time no matter if the report date falls on a public holiday or a week end. So we don’t need a manual intervention to run the report like a robot, but instead the subscription option deliver the robotic service. As this is alternative to running reports on demand, this also gives a great option to execute and deliver a report dynamically based on a condition derived with Dynamic Subscription option, like if the data exists or if the user exists. Below picture explains some of the options available in subscription option. A quick demo on subscription and dynamic subscription is available here. Can I override Reportserver DB? For those of you who are already aware of these databases, has anyone tried changing this? If yes, then you must have known the database a bit better. But have you ever wondered whether it is good to make changes to the system database? The answer is strictly NO, however at very rare situations, for those who are very well aware of what to change and if it is safe to do so have done some changes like me. Here is one of the scenarios that I have worked on, which can give you bit more understanding on this. I had a consultant working for the company who used to create schedules to deliver a report to secured shared drive. After he left the company that job failed after 3 months. While analysing such issue, identified the company had policy to change the password of old employees for first 3 months and then remove them permanently after that. So after 3 months once the AD account no longer existed, the jobs started failing. During this time, I cannot raise a IT helpdesk to create the user again but raise the helpdesk ticket to have a system AD account for schedules and then went to the ReportServer DB and modified the schedules to totally move the owner name of the schedules to be the new system account. That’s it job done. 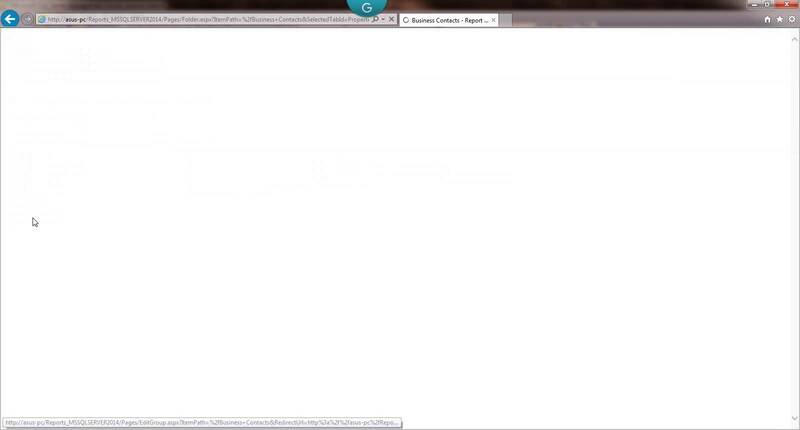 Below is also a screenshot for you to understand on Reportserver DB and what it can support. If you have already practised your SSRS environment locally, you might have played with less then 3 users and couple of AD groups, but what about a situation given like below image with more than 300 reports, 100+ users? 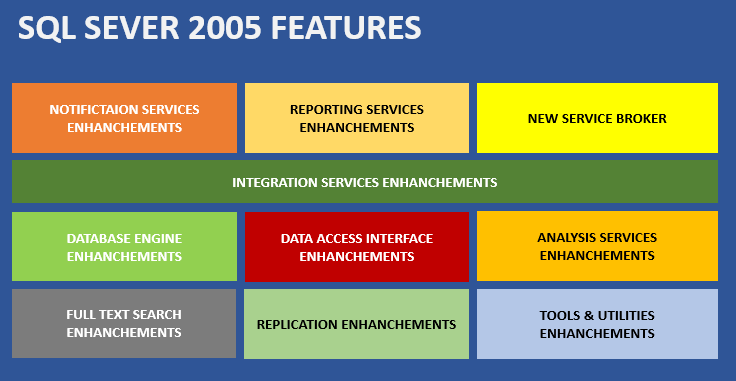 How it will enable a DBA to maintain the security based on business requirements. You can add all users individually to the SSRS Report manager and grant them access to the relevant folder with all related hierarchy folders which is a big hassle. Here is where, the windows AD groups jumps in with magic wands to enable even non DBA’s like IT support guys to maintain the users list (of course with proper approval process) on who can access what reports across various departments or within the same department. You simply have to do the above exercise once with the AD group and SSRS Report manager automatically picks the relevant AD Group from Windows Active Directory. This intelligent tool will then enable a IT support guy to easily add / remove the users based on the requirements. You can also have a quick demo on security with AD here. 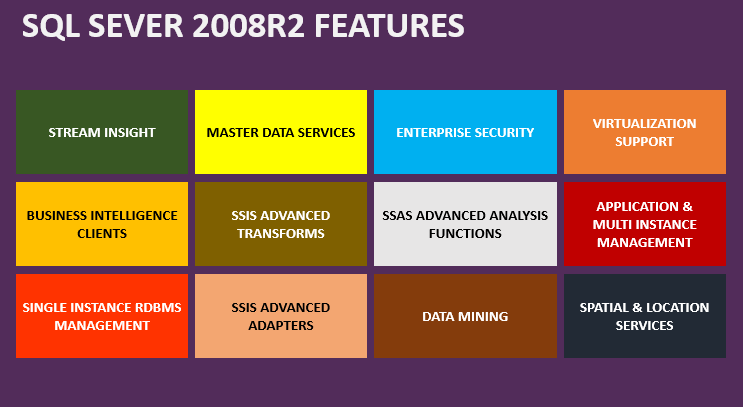 What features do we have in terms of making use of the full installation of SSRS environment? Report manager does have features like viewing the available reports, search for any specific report, print and subscribe to deliver at required intervals. It also enables (if allowed) to create folders, reports, upload your own word/excel/ppt documents, secure, maintain and organize them again. 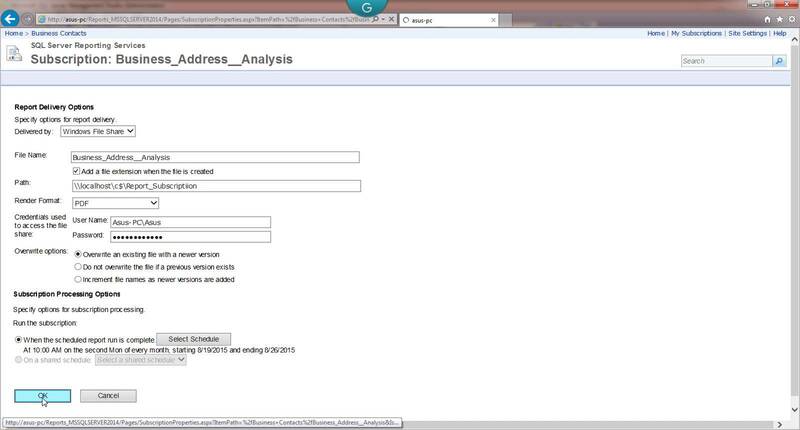 You can enable a user to login to SSRS browser based tool and you can let them browse the report in your own organized way, enable them to manage their own contents in a specific folder(s), to create their own reports and store in their “My reports” folder, publish their changes to the reporting application directly. Also you can let them give access to Report builder tool, which will enable them to start creating / modifying the reports using browser based application and the BIDS is not required. And a video is available here for you to take a closer look. Data warehouses in this initial stage are developed by simply copying the data of an operational system to another server where the processing load of reporting against the copied data does not impact the operational system’s performance. Data warehouses at this stage are updated from data in the operational systems on a regular basis and the data warehouse data is stored in a data structure designed to facilitate reporting. 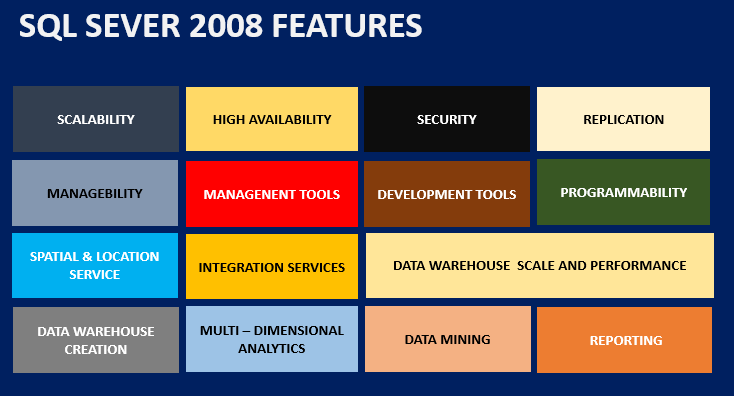 Data warehouses at this stage are updated every time an operational system performs a transaction. The data warehouses then generate transactions that are passed back into the operational systems. In the Data Awareness Programme to students, I have shown below slide to let them know on how many versions have released, so far. As you can see below, the first ever version released was in 1989 and we are in 2014 now. 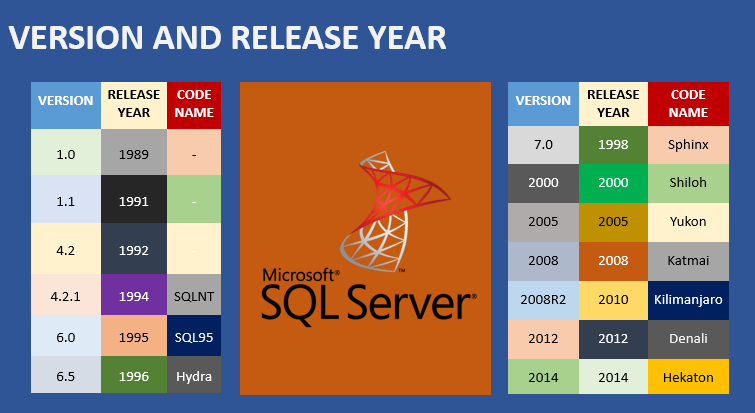 SQL 2016 CTP versions are available but expected to release in beginning of 2016. There were totally 13 releases in last 25 years and the product has become very much stronger than ever. 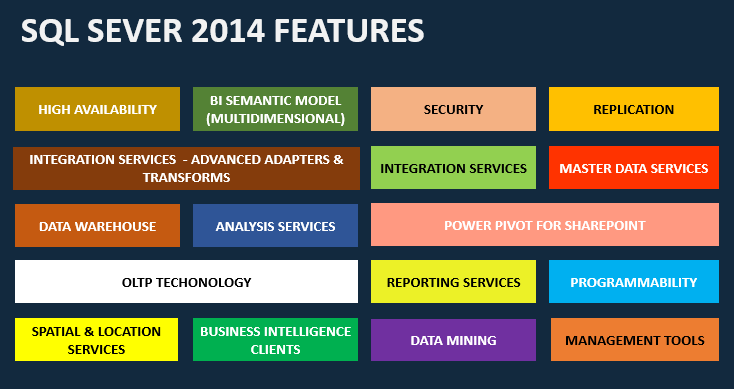 SQL 2016 is going to be a huge one with easy integration to cloud. 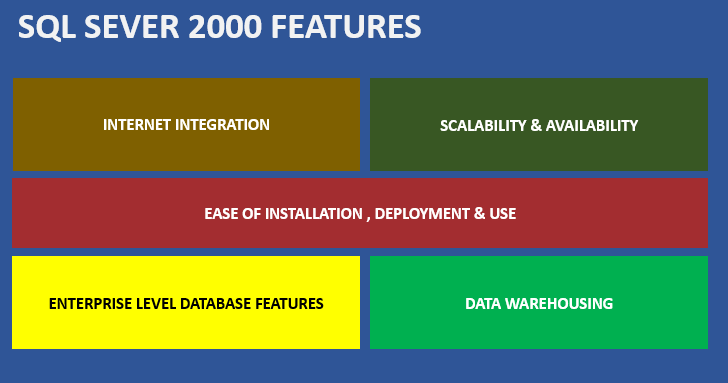 In my Data Awareness Programmes, I also spread the available SQL Server features from 2000 to 2014 in below slide formats. 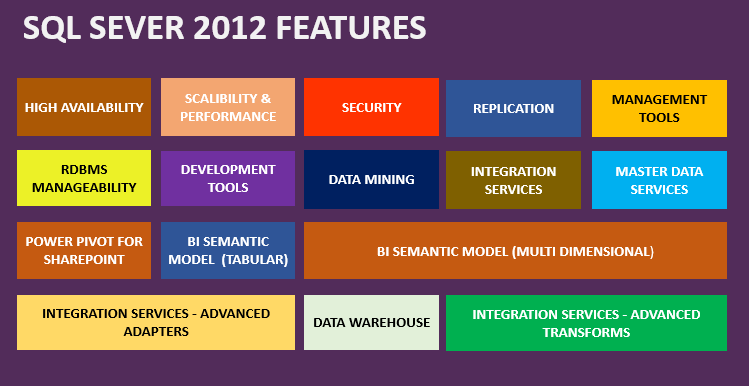 This will also give a quick glimpse on all SQL Server releases with available features in one single article. Note: These slides covers only a noticeable features and does not cover every single feature on it.